All our tanks are O2 cleaned giving you the flexibility to dive on Nitrox or Trimix. We are very competitively priced at only £50 per week for a twinset and £30 per week for a single cylinder. This facility allows our customers the added opportunity to FLY into Orkney. Steel 240 bar twin 12 litres, all with isolator manifolds. 11 litre Ally cylinders, ready rigged for use as side mounts. 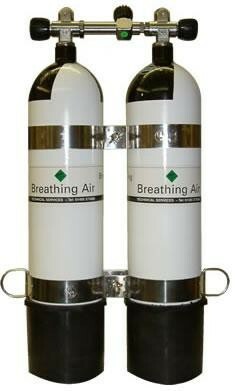 We can also cater for Rebreather divers. All cylinders have removable studs for use as either (A-Clamp) International or DIN.